Yarn | The Messy Palette . . .
Just for fun, I’m planning a brief digression from palette presentations—in order to share some other arts that I’m passionate about. Painting is a huge part of my life, but there are other huge parts as well. For starters, FIBER ARTS. For eighteen years, when we lived in the Town of Eagle in Southeastern Wisconsin, I raised a spinner’s flock of from two to eight sheep—fine wool breeds. At that time, I taught Fiber Arts Workshops in our home. I found a (rather crochetty) gentleman to make a large rustic sign for the entrance to our drive: FIBER ARTS: Spinning, Weaving, Knitting . . . .” plus phone info, etc. But what a struggle, getting that sign custom made. The sign artist was bent on refusing to make the sign as I directed because, in his rather vehement words, “The is no such thing as ‘Fiber Arts’ “. Finally I won. I had cash, and money talks. But I’ll never forget my shock over someone trying to tell me that “There is no such thing as ‘Fiber Arts’ “. Yikes! Anyway, I’m as nutty about fibers, as I am about my paint brushes and tubes of paint. Recently some friends and I have been knitting prayer shawls for the local Vince Lombardi Cancer Center. 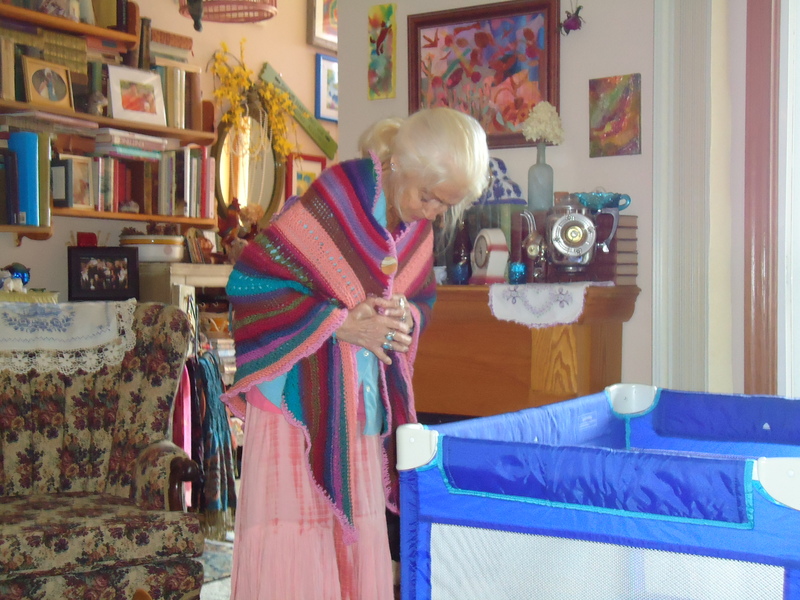 Since a lot of shawls can be produced at a rapid pace I make shawls for family members, friends, and myself as well. 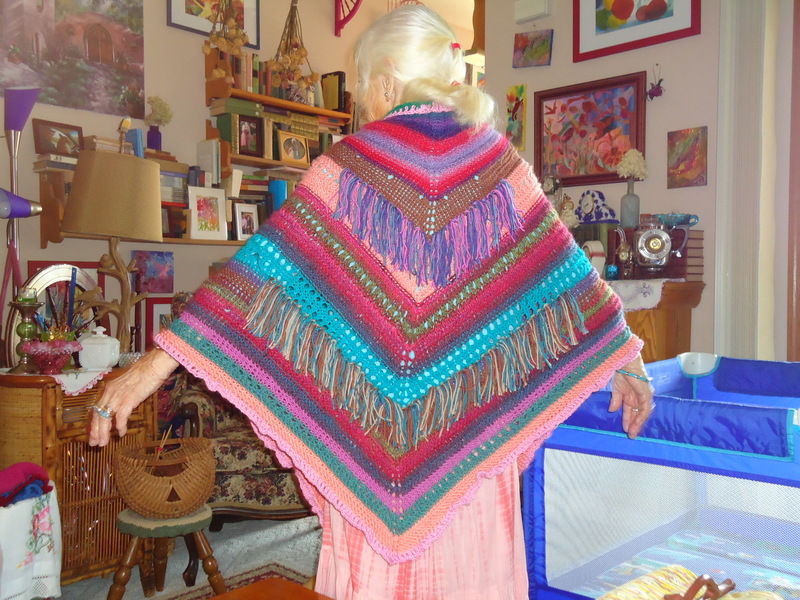 Recently I had a shawl ready for the Center, when I learned that a friend in Seattle has cancer. So that shawl went to Seattle, instead of to the local Cancer Center. The shawls are too much fun to make. If they were any more exciting, I wouldn’t be able to stand it! Each one is an original, one of a kind, in a variety of colors that might have made Old Testament Joseph weep with envy. I love color, and I love to make up garments as I go along—incorporating pattern stitches. If I discover that I’ve inserted a color that doesn’t fit, or a pattern that doesn’t add anything to the mix, I simply rip—sometimes many rows—and start over to get it right. It’s good to include button holes and buttons—at least one per shawl. This prevents the slipping and sliding that shawls otherwise tend to do. The buttons are special, some hand-made clay or fabric creations from art fairs, and others from yarn stores. Currently I’m working on a Southwestern shawl in New Mexico colors. It will have two buttons, roses in a brushed gunmetal grey substance resembling pewter—made in France. Finally I trim edges or interior areas with a double crochet or fringe, or both as in the above example. 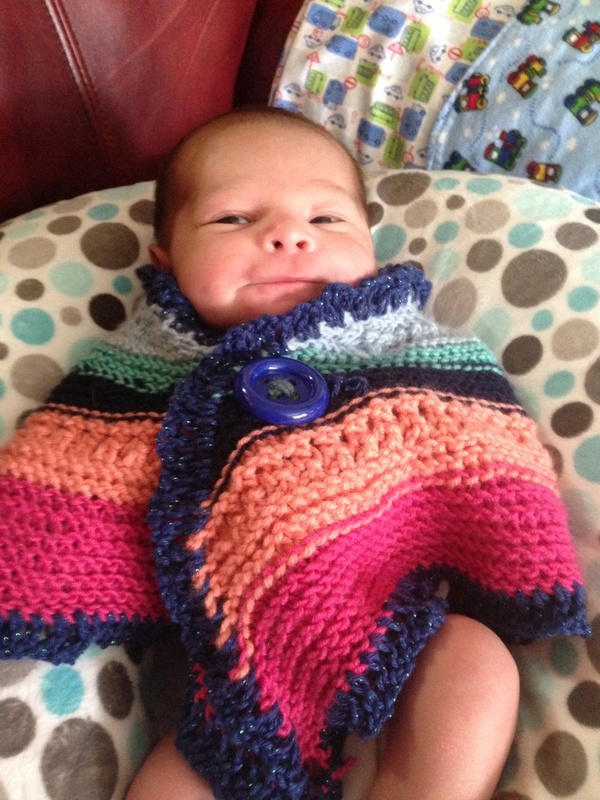 Here is one more recent creation: perfect for our newest family member, great-grandson Leonardo Aguilar II. His Mexican Daddy says Baby Leo likes to be wrapped up “like a little burrito”.